Invite your guests to step into the garden and feel the urban world fade away. Fairchild Garden is always in bloom. This beautiful botanical garden that showcases rare tropical plants including palms, flowering trees, vines, lakes and much more. 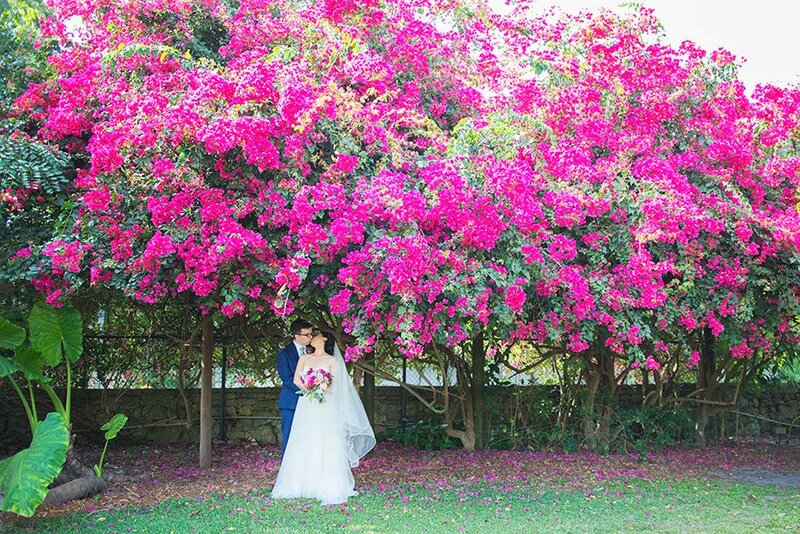 83 acres of lush foliage, breathtaking vistas, and peaceful surroundings create this unique oasis. Your guests will enjoy an unforgettable aesthetic experience in a naturally welcoming environment. 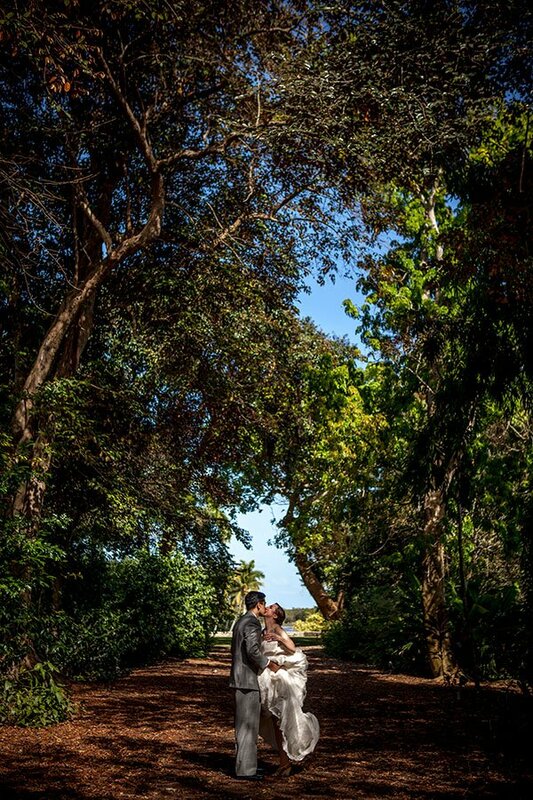 View our Wedding Catering Photo Galleries to experience a few of the weddings we have catered at Fairchild Tropical Botanic Garden. 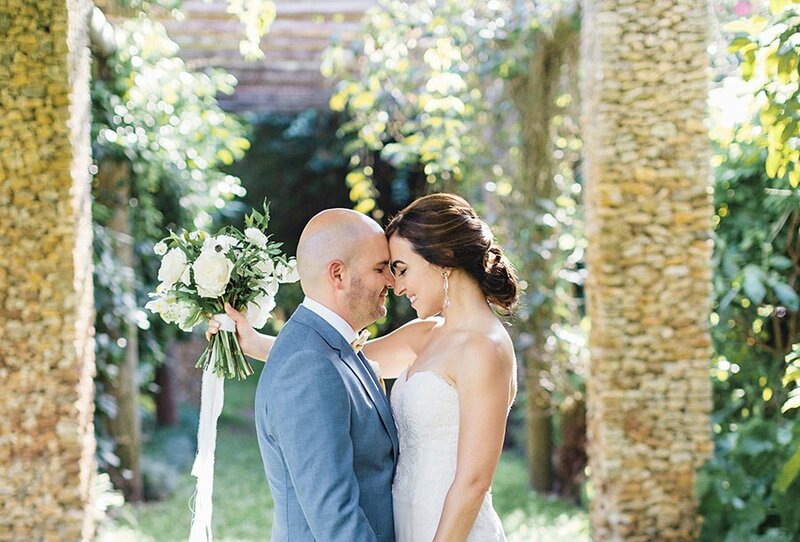 Imagine saying "I do" as the sun sets on the coral rock grottos of the elegant Bailey Palm Glade. Picture your guests rising to watch your grand entrance across the Land Bridge onto the historic stage of the romantic Amphitheater. 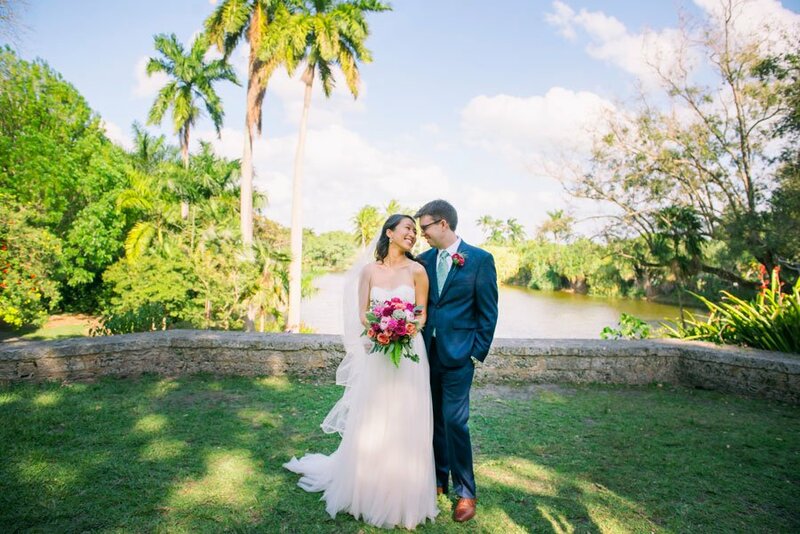 Those who have celebrated their wedding day at Fairchild know there is nothing quite like a Fairchild Tropical Garden wedding. Moreover, hosting your event at the garden helps to support their mission to explore, explain and conserve the world of tropical plants. Fairchild Garden is one of the premiere conservation gardens in the world. With five reception areas and multiple outdoor spaces, the possibilities are limitless. You can host an elegant black-tie affair or a more casual brunch or bridal luncheon. 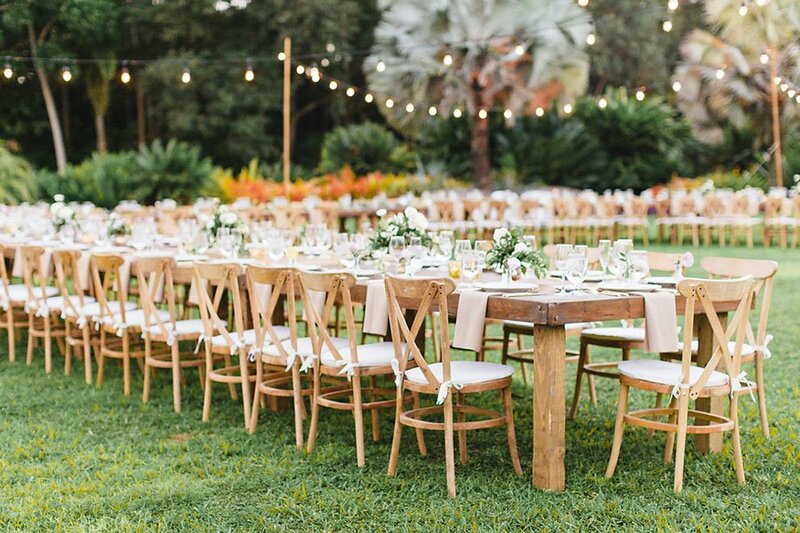 Design the fairy-tale wedding of your dreams and also a festive rehearsal dinner. With ample meeting space, Fairchild is an ideal location for your next corporate event or meeting. You can organize a thoughtful lecture series, a musical performance or simply a party to enjoy exquisite cocktails at sunset. 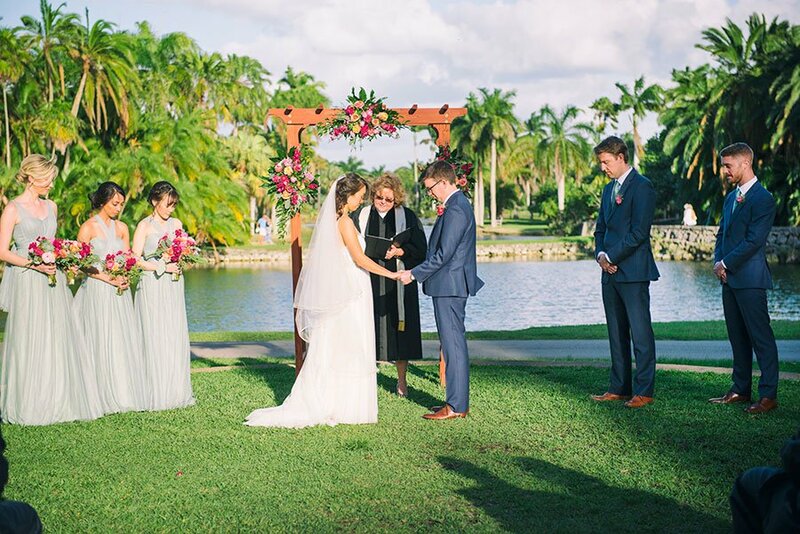 As a preferred vendor, Eggwhites Catering has been producing luxury Fairchild Tropical Botanic Garden weddings and events since 1994. We understand the layout of the space, the various “do’s and don’ts” of the venue. We will bring your event to life beautifully while adhering to the guidelines that protect the integrity of the space. Finally, working with your venue’s recommended vendors ensures a streamlined and collaborative planning process. Delicious food and drink, artful presentation, impeccable and professional service and over two dozen years of expert experience. These are the hallmarks of an Eggwhites Catering special event. You can expect flawless timing, execution and attention to detail at an Eggwhites Catering wedding. Preview our sample wedding menus. Eggwhites offers more than just wedding catering. We cater social events, corporate events, mitzvahs, engagement parties, rehearsal dinners and more. Eggwhites is a premiere, full service catering company. We serve Miami, Fort Lauderdale, Palm Beach, the Keys and surrounding areas. Call us at (305) 892-2066 or REQUEST A QUOTE today. Let's plan your next special event!